One of the most popular requests we've had from plotaroute.com users, is to provide a way of showing more than one route on the same map. We're pleased to announce today that you can now do this with our new Route Collection feature, which enables you to compile collections of up to 30 routes and then display them all together on one map, along with a colour coded key. 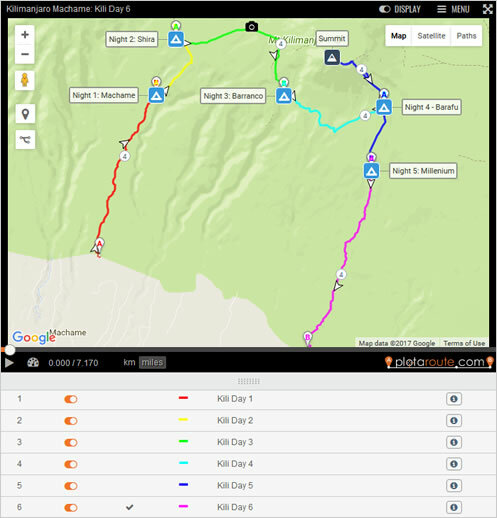 These new multi-route maps are great for triathlons, multi-day challenges, showing different route options for an event and alternative hiking trails. To get started, head to the new Route Collections page. Brilliant! Allows grouping day horse rides into Multi-day Distance Horse Trails. Thanks John. David. Hi Murray - it displays OK for me here, are you still having problems with it? If so, can you let me know what browser you are using please? I've just tried the 'Collections' feature which is excellent. It has enabled me to join up three routes which together form a circuit. It will also provided me with a solution to the 'alternative route' issue which I've encountered a couple of times. When selecting a collection to view it, I think it would be better if all of the routes in the collection appeared on the map by defalut (rather than just the first.) After all it is 'the collection' that is being viewed and to see just one route gives the imprssion that something has gone wrong. Re Routes collections. THe route collection that I first tried now works, but i have made a 2nd one which has done the same as the first... mainly black screen. Does it take a while for it to work? Hi Murray - the route collection is not showing anything as the routes you've selected are Private rather than Public. You'll need to change them to Private. You can do this on your My Routes page. I presume you meant to say change them to public rather than private? I have changed them to public and still screen is still black! This is what happened to the last set i did. For horse riders we are going to link Plotaroute rides to the British Horse Society Marie's project, particularly for Scotland. This project groups rides (day) using index maps for Distance Trail Rides. So perfectly parallels what you have done. Will update by email. David. Hi Murray, yes sorry, I meant change them to public. The collection is probably cached in your browser so I think that's why the changes haven't taken effect yet. Try refreshing the page. Or you could create a new route collection. It should refresh automatically after 24 hours though.